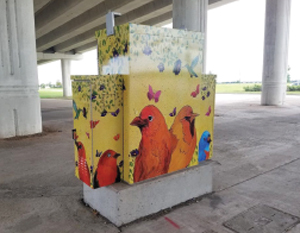 The Sugar Land Cultural Arts Foundation (SLCAF) is pleased to present an exhibition featuring regional artists selected to transform traffic signal control boxes in Sugar Land from functional infrastructure into colorful and inspired works of art. The Traffic Box Art Project Exhibition will run from November 7th to December 7th, with an opening reception on Wednesday, November 7th, from 5:30-7:30 pm at the Sugar Land Art Center and Gallery, 104 Industrial Blvd. Suite Q in Sugar Land. This event is open to the community and refreshments will be served. Thirteen regional artists will be featured in the show: Heather Pizzitola, Mike Doan, Joy Chandler, Lauren Luna, Rose Miao, Amanda Levermann, Rosa Cruz, Judy Hope, Anita Nelson, Nataliya Scheib, Vivienne Dang, Debra Jan Hall Heintschel and Jamie Adams. The City of Sugar Land, with input from the SLCAF and community members, selected the artists, which comprise a diverse cross-section of the local and regional community, and range in age from 18-years-old to adults. Artists submitted digital files that were fabricated into vinyl wraps by NightBright USA. The traffic signal control cabinets are along ALT 90 from Easton Ave. to Dairy Ashford Road and one location on Highway 6 next to the Sugar Land Regional Airport entrance. For more information on SLCAF and how to get involved, visit www.slcaf.org.